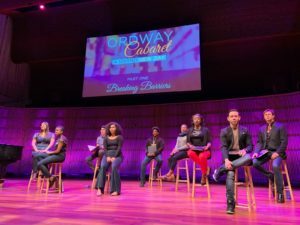 The Ordway has just launched a new Cabaret series, “A Brand New Day.” Based on its inaugural show, “Breaking Barriers: Love on the Broadway Stage from Hair to Hamilton,” which I attended January 31, this is an appropriate title. It’s not like any cabaret performance I’ve seen, and I mean that in a good way – a very good way. Instead of “selling” songs, these performers aren’t selling anything; they’re telling stories – fascinatingly about themselves: why they are performers, how they broke barriers to get there, why this song or that, in particular, is meaningful for them. That means you hear the songs in a whole new light, translated into a new “language,” if you will, and created by a personal, impactful experience. So, what barriers? These performers don’t slip into the easily “castable” molds for a whole variety of reasons, many of them because of ethnicity, but it goes beyond that. Don’t scrunch up your face thinking about this. Let me explain. In a scripted play, having the performers as characters talk about themselves could certainly come off as contrived and sentimental. But not here. This is real life; this is authentic emotional content. This is you and me, audience, not just getting behind the scenes, but sitting down at their kitchen tables and hearing stories we would never see in the playbill. They were darn good stories, too. Delightful, funny, touching, inspiring – with wonderful singing. Don’t you want to see theater like that? So what was the impetus behind this fresh, new approach? I asked the Ordway’s Producing Artistic Director Rod Kaats that question, and I got some wonderful insight into a much larger picture. The operative phrase is “performing arts center,” and the vision its founder Sally Ordway had about the intersection of the arts in music, theater, dance and opera. The Ordway’s space is home to other arts organization and it brings in touring productions, “Then, you can only afford certain [touring] shows,” he says. This has to do with the number of seats. The Ordway’s 1900 seats, he says, is the smallest number for a Broadway touring show in the Twin Cities. Kaats’ team decided to create “A Brand New Day” cabaret series, with opportunities for diverse talent, yes, but also building in a means for the performers to be part of a conversation about diversity in musical theater. And the audience loved it. “We never anticipated that the audience would applaud after any of the speeches,” he said. But the audience did – and often. Because the narrative part of the show is extemporaneous (although rehearsed) there are imperfections, but I liked them. This spontaneous quality made the experience immediate and intimate – in a completely comfortable way. I credit Kaats with the concept; hats off to the performers who pulled it off with such grace: Fernando Collado, Brianna Graham, Leo James, John Jamison, Suzie Juul, Ileri Okikiolu, Rudolph Searles II, Dane Stauffer and Allyson Tolbert.